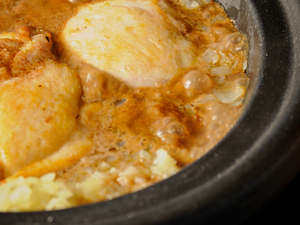 Chicken Tagine, a Moroccan stew that makes a wonderful addition to the Passover table. Several hours before making the dish (or the night before) sprinkle approximately 1/2 teaspoon salt on each side of the chicken (use more or less salt depending on the size of each piece). Hold in the refrigerator until you are ready to cook the dish. Thoroughly combine cinnamon, ginger, pepper and salt with 1 cup water. Reserve. Heat 2 tablespoons olive oil in a large skillet or Dutch oven over medium-high heat. Add onion and cook until tender and translucent. Reserve onion. Add 2 more tablespoons olive oil to skillet. 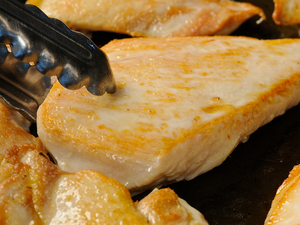 Pat chicken dry with paper towels and lay flat in skillet. Cook chicken, turning once, until lightly browned on both sides, approximately 3-4 minutes per side. Remove chicken breasts and reserve. transfer chicken thighs and onions to a tagine over medium heat). Pour spice/water mixture over thighs and onions and bring to a boil. Reduce heat, cover tightly, and simmer for 5 minutes. Turn thighs. Return breasts to the pan, and cook an additional 5 minutes. Add prunes to the pan, evenly distributing them between the chicken pieces. If necessary, add more water to barely cover the prunes. Simmer in the covered pan approximately 15 minutes, occasionally turning the chicken. If the sauce becomes too dry and begins to stick to the bottom of the pan, stir in additional water as needed. Remove from heat when the chicken and prunes are tender. Add prunes to the pan, evenly distributing them between the chicken pieces. If necessary, add more water to barely cover the prunes. Simmer in the covered pan approximately 15 minutes, occasionally turning the chicken. 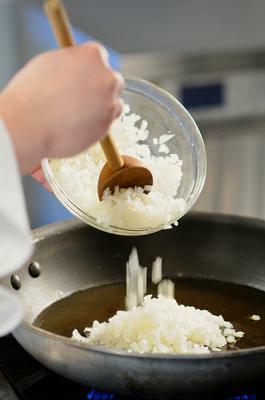 If the sauce becomes too dry and begins to stick to the bottom of the pan, stir in additional water as needed. Remove from heat when the chicken and prunes are tender. Transfer chicken to serving platter. Stir half the almonds into the pan with the sauce, then spoon over chicken. 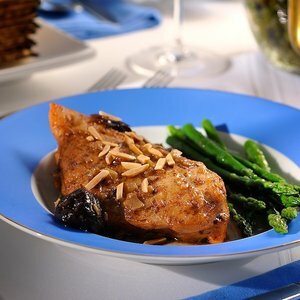 Garnish with remaining almonds, serve and enjoy!